Since immigrating to the U.S. from India at age 14 with "pockets that did not run very deep," Jay Pandya would discover a wealth of opportunity awaiting him in his new home. "Since I was young, I only focused on things that I felt passionate about," says Pandya today. "Luckily, business fell into that category and I started my own company at the age of 19." These days, Pandya, winner of the 2018 Mega Growth Leadership MVP Award, presides over a commercial real estate, retail, and construction empire as the founder and chairman of Philadelphia-based Rohan Group. Pandya, who has made his mark in franchised QSR brands, is the largest franchisee of Checkers & Rally's in the U.S., and of Pizza Hut in Pennsylvania. More recently, the sports enthusiast has also made headlines for his quest to help Americans fall in love with the popular international game of cricket. Pandya is a die-hard cricket fan, backing the launch of a professional cricket league in the U.S by 2020. 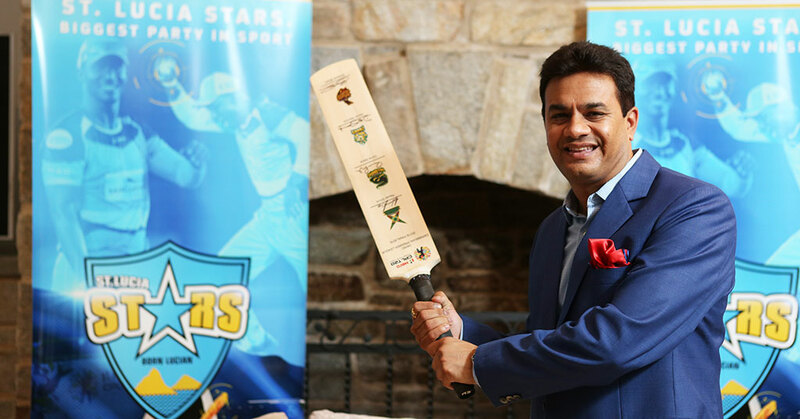 In addition to owning the St. Lucia Stars, a team in the Caribbean Premier League, he is chairman of Global Sports Ventures and Royal Sports Club. To help bring cricket to the U.S., Pandya helped negotiate a $70 million licensing agreement between Global Sports Ventures and the United States of America Cricket Association in 2016, with plans to build multi-purpose "cricket-centric" stadiums in franchise cities throughout the nation. "I always had a desire for the sport of cricket," Pandya says. "As I grew older, so did my love for the sport. By purchasing the St. Lucia cricket team, not only have I opened doors for business opportunities, but I also fulfilled my long love for the fantastic sport." Pandya recently became part owner and U.S. master franchisee of Smaaash, a Mumbai-based chain of virtual reality and family gaming and dining centers, which he says has "phenomenal numbers." He also expects to partner for expansion with other global restaurant brands and eventually take his company public. Pandya admits that, at times, he may take on too many passionate projects, but he wouldn't have it any other way. Eating at a Pizza Hut when we moved from India to Philadelphia. Now owning every Pizza Hut in Philadelphia is a dream come true. I have also been influenced by Steve Jobs and India's Prime Minister Narendra Modi. Jobs has inspired me with his innovations and all the changes he brought to the world. Modi was previously chief minister of Gujarat, where I am from, and the changes he brought to the state inspired me to step up and be successful. Becoming the largest Pizza Hut franchisee in Pennsylvania and the largest Checkers & Rally's franchisee in the country. Building a company with over 25,000 employees. Creating jobs and economic development with the planned construction of cricket-centric, multi-purpose stadiums throughout the U.S.
Monday through Friday, 12 to 13 hours a day. Occasionally on weekends, depending on my schedule and travel plans. Magazines and newspaper articles. I don't get a chance to watch much television, so I read the Times of India, Bloomberg, CNN, and local newspapers online. The best advice I have received--and try to live by--is to be positive and confident in yourself. My passion is people. I love meeting our guests, vendors, and suppliers throughout the U.S. from different localities. I work with so many different people from throughout the nation. It is such a wide spectrum throughout our beautiful country. I wouldn't trade it for anything. Executing and taking the proper action to get things done quickly. If something needs to get done, we will do it. We are innovative through our ideas and the use of technology. We are early adopters of new technologies. We bring the efficiencies from these technological advancements to our bottom line to provide cost savings to our customers. I am all about connecting. Face-to-face, heart-to-heart connections with other people have really helped me get to where I am today. Finding more time to really help society. It is difficult for me to instill patience when it comes to my company's growth. At times I have a tendency of taking on too many passionate projects. Positive and a family guy. Convivial and dedicated. How do you hire and fire, train, and retain? We hire people on their ability and based on their merits. We have great employees. We usually look to hire from within; however, we do expand our wings and recruit people from the outside. We have a great benefits and bonus program and are very competitive in the marketplace. The brand names we have throughout the region offer people many opportunities to be in a lot of different positions. Build and develop between 10 and 15 restaurants across our brands. Year-over-year sales and customer counts. I am looking to expand by building and acquiring more restaurants. We want to keep doing what we are doing, keep progressing. We also plan to build 20 Smaash centers in the U.S. over the next three years. Each is going to be approximately 20,000 square feet. We are also looking forward to being part of the successful global brand Arby's. We are looking to expand our wings with other food chains and are also eager to get involved with other different fields of business. Our relationship with our employees is already immensely close. We are looking for our people in the field to eventually have ownership in the company. We want to work toward taking our company public. I am very passionate about the brands I am involved with. The day I stop feeling satisfied with a brand and my passion for it is lost is the day I will look to exit. Why do you think you were recognized with this award? Checkers was very kind to nominate me. It is not my award, it is the company's award, and we are honored and grateful for receiving it. We strive to grow, elevate, and partner with each brand to be the best that it can be. I am enthusiastic about everything I do, whether it's sports, franchising, or giving back to our community. How have you raised the bar in your own company? I live by a set of principles, and that same ideology has spread throughout the company. Also, through my willingness to take risks and try new ideas and technologies early on. What core values do you think helped you win this award? Trust and dedication--not only in our people, but also their decisions. I am proud to own a company that has employees who have made the company itself successful. How important is community involvement to you and your company? We are part of every community our Dunkin' Donuts, Checkers & Rally's, and Pizza Hut restaurants serve. We are very involved with fundraisers and events and connecting with our police and firefighters in each community. What leadership qualities are most important to you and to your team? Integrity, loyalty, customer-centric, staying positive, and eager to grow and lead.